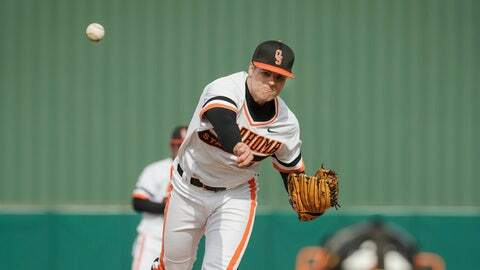 Pitcher Jason Hursh, the Braves' 2013 first-round draft pick out of Oklahoma State, will attend spring training as a non-roster invitee. The countdown to spring training is well under way as teams start to announce full lists of attendees, including new additions and top prospects. The Atlanta Braves joined the club by announcing their non-roster invitees on Monday afternoon, featuring 2013 No. 1 draft pick Jason Hursh and highly-regarded pitcher J.R. Graham. Gosselin, a middle infielder, is the only non-roster invitee to log playing time with the big league club in 2013, playing in four August games while the team dealt with injuries and Dan Uggla’s eye surgery. There is potential value in the selections, though. Last year, the franchise brought along 21 non-roster invitees, including versatile lefty pitcher Alex Wood and catcher Evan Gattis, both of whom emerged as young standouts within the organization. Wood finished the season 3-3 with a 3.13 ERA while splitting time as a starter and reliever. Gattis hit .243/.291/.480 with 21 home runs as a catcher and outfielder — he’s projected to be the Opening Day starter behind the plate with Brian McCann now playing in New York. Joey Terdoslavich, an outfielder who played in 55 games for the Braves last season, also impressed as a non-roster guy in 2013. Pitchers and catchers report on Feb. 13, with position players following along on Feb. 18. The first full squad workout will be held on Feb. 19.